Nobel headgear became quite elaborate during the period – we have all see the “princess hats” which were actually worn for a period of time. Some are very high, other very wide and some gives really different head shapes. 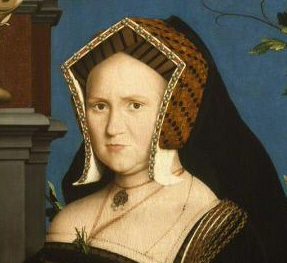 Married women would generally always wear something on their heads when out in public. Women are almost always shown to have their hair styled in some way even in pictures of them dressing or bathing. Both men and women would wear hoods with long tails called a liripipe (studshætte). 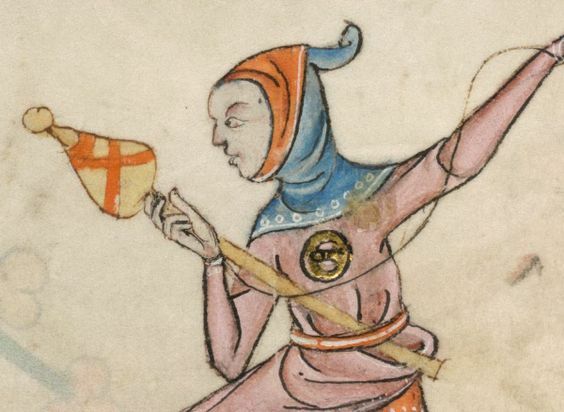 I have another post on commoners and their headgear is mostly covered in that post: Here. Most of the images are of people from the upper classes but it isn’t exclusive to that. If you are more interested in the male headgear you can find that here. I gather pictures of head gear. I find them in illuminated manuscripts, sketches and in paintings. Some of the pictures are quite small and a bit blurred, but I thought it was important to have pictures from different sources rather than just the famous high quality ones. They are organized by century and by style. A simple veil is just a peice of fabric worn over the head, either pinned to a fillet or directly to the hair. Some styles are very simple while others are very elaborerte. The fabric can be either opaque or see though, depending on the period or wealth of the wearer. The hair under the veil can be either loose, braided or worn up. Veils are quite often worn over other hairgear. Especially common woman would wear their veils wrapped around their head in some fashion. Sometimes it tied back and other times it is worn a bit like a hijab or wrapped like a turban. The wimple and veil of the 1100’s still seen on nuns today, was still worn mainly by older women and widows. Veils and gorgets were also common. A gorget covers the neck. It was a tube that draped around the neck and sometimes covered the upper chest. 1maniacalmedievalist The style of wimple/gorget and veil is worn thoughout the medieval and renaissance period. 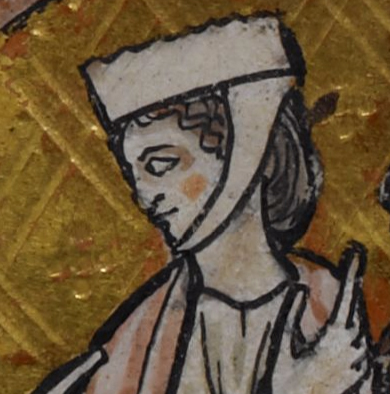 Possibly the most comfortable 1200’s and 1300’s headgear is the cap, which is also called St. Birgitta’s Huva.2maniacalmedievalist. It is a cap a tie was wrapped around the head twice to secure the cap to the head. It is found in artwork from all over Eourope. An intact example has been found in Sweden and the Museum of National Antiquities in Stockholm has it in their collection. 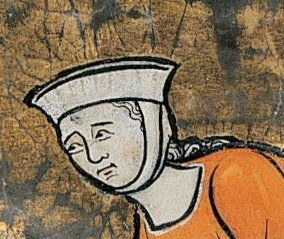 One distinctive feature of 1200’s and early 1300’s women’s headwear was the barbette / barbet (chin band) to which a hat or various other headdress might be attached. The barbette was a band of linen that passed under the chin and was pinned on top of the head. A fillet or circlet is a round band worn around the head and over the hair. Elaborate and costly versions of these eventually evolved into crowns, but fillets could be made from woven bands of fabric, leather, beads or metal. Fillets are unisex. 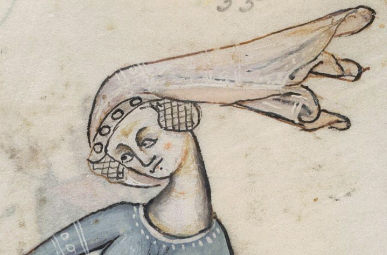 Later in the 1200’s the barbette and fillet were reduced to narrow strips of cloth, and the entire hairdress might be covered with the crespine, the hair fashionable bulky over the ears. The coif and barbettes was white. 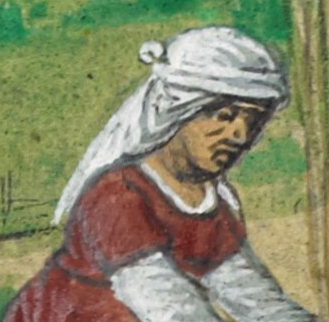 3Wikipida The barbet was worn with a linen fillet or headband, or with a linen cap called a coif, with or without a couvrechef (kerchief) or veil overall. It passed out of fashion by mid-1300’s. 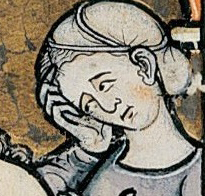 From the 1200’s on the hair was often confined by a net called a crespine or crespinette or caul, visible only at the back. The hair net is often shown as gold. Woman in a blue capuchon lined with red fabric. A hood, originally covering the head and shoulders with a hole was cut in the fabric to frame the face. 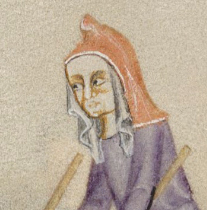 The point of the hood was often very long – called a liripipe. Men would wear them either on their head or down, but I only find woman wearing them op. 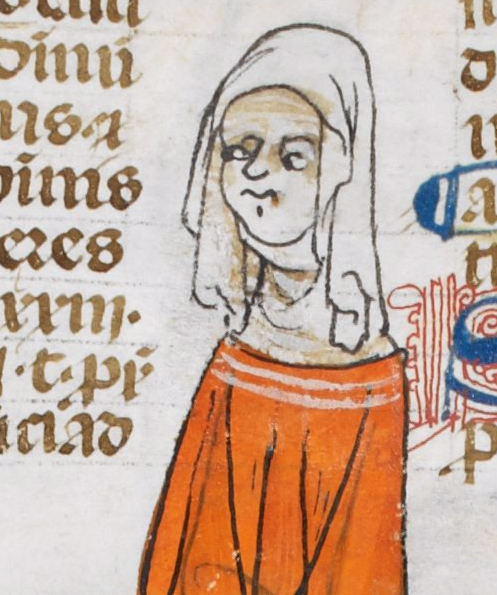 From the 1300’s onward woman are sometimes shown wearing an open hood either alone or over other headgear. The seem to be a simple version of the liripipe with a short tail or no tail. Bosses or templers: late 1200’s to end of 1300’s decorative cauls of network or linen covering thick plaits of hair, generally artifically enlarged and arranged on each side of the head above the temples. Worn with a veil. 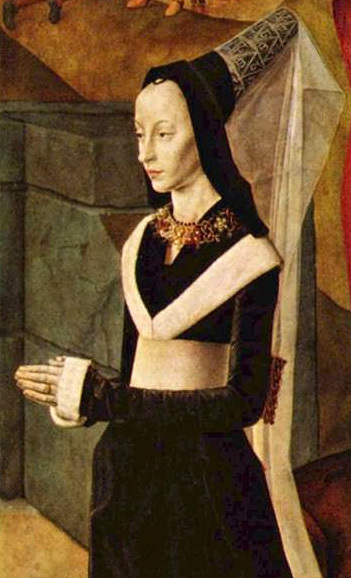 Isabella of Portugal, Duchess of Burgundy in a divided hennin. Copy of original of 1445–50. The crespine of Northern Europe had evolved into a mesh of jeweler’s work that confined the hair on the sides of the head by the end of the 1300’s. Gradually the fullness at the sides of head was pulled up to the temples and became pointed, like horns (à corné). By mid-1400’s, the hair was pulled back from the forehead, and the crespine, now usually called a caul, sat on the back of the head. Very fashionable women shaved their foreheads and eyebrows. A variation on the caul where a wired headdress with a veil to create a horned effect. Mostly popular in the early 1400’s. 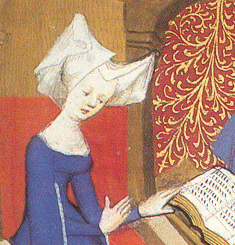 A bourrelet, or “padded roll” hat, was fashionable in the 1300’s and 1400’s. These hats were made principally of rolled fabric. In the early 1400’s the bourrelet showed up. It was a padded roll worn by woman as a head drees, in various shapes. Sometimes it was quite small and other times it turned into a huge roll. It was worn with other headgear to create a even more dramatic effect. 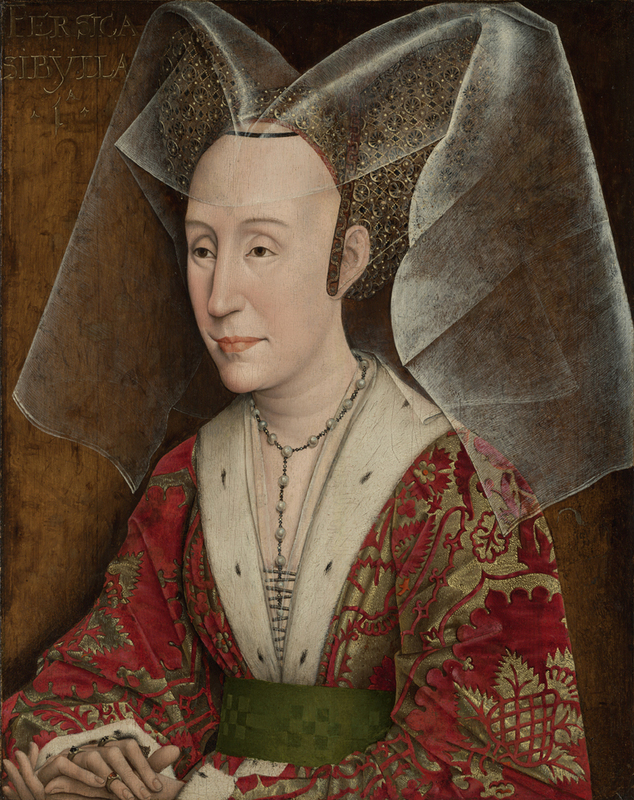 Margarete van Eyck wears a horned headdress with a ruffled veil called a kruseler. 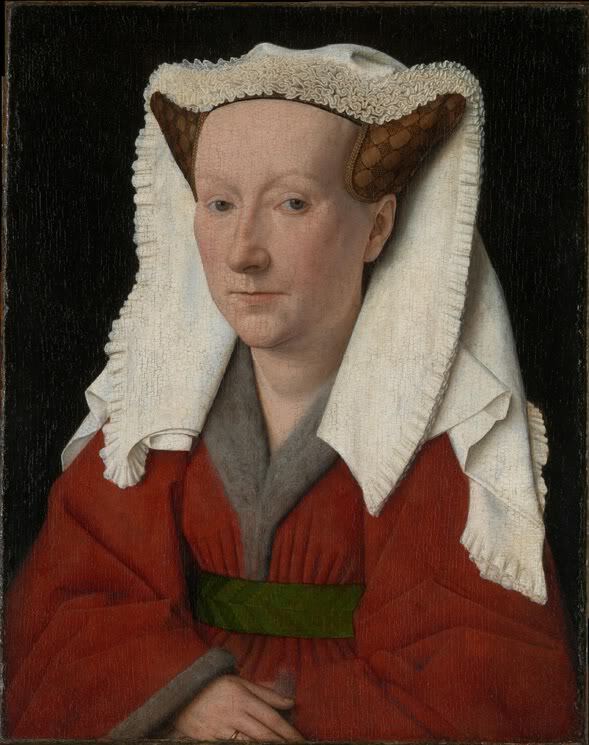 Her red gown is lined in grey fur, 1439. A brief fashion in the 1400’s added rows of gathered frills to the coif or veil; this style is sometimes known by the German name kruseler. 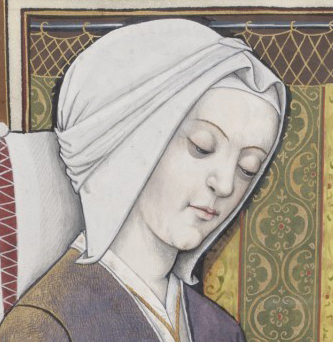 Maria Portinari wears a truncated cone hennin with a veil draped over the back. 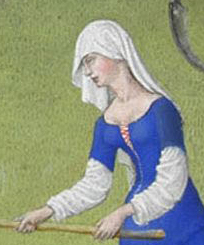 The black loop on her forehead is thought to be part of the wire frame that balances the hennin. 1478. 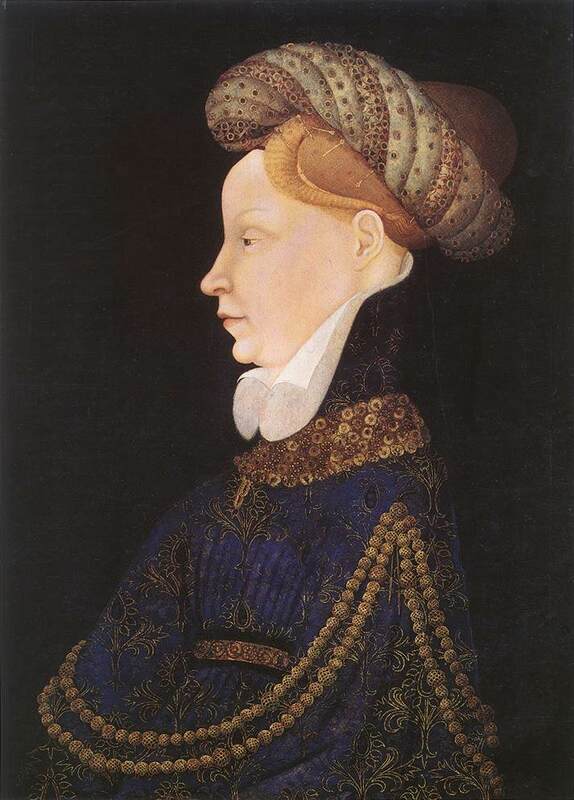 The most extravagant headdress of Burgundian fashion is the hennin, a cone or truncated-cone shaped cap with a wire frame covered in fabric and topped by a floating veil. Later hennins feature a turned-back brim, or are worn over a hood with a turned-back brim. 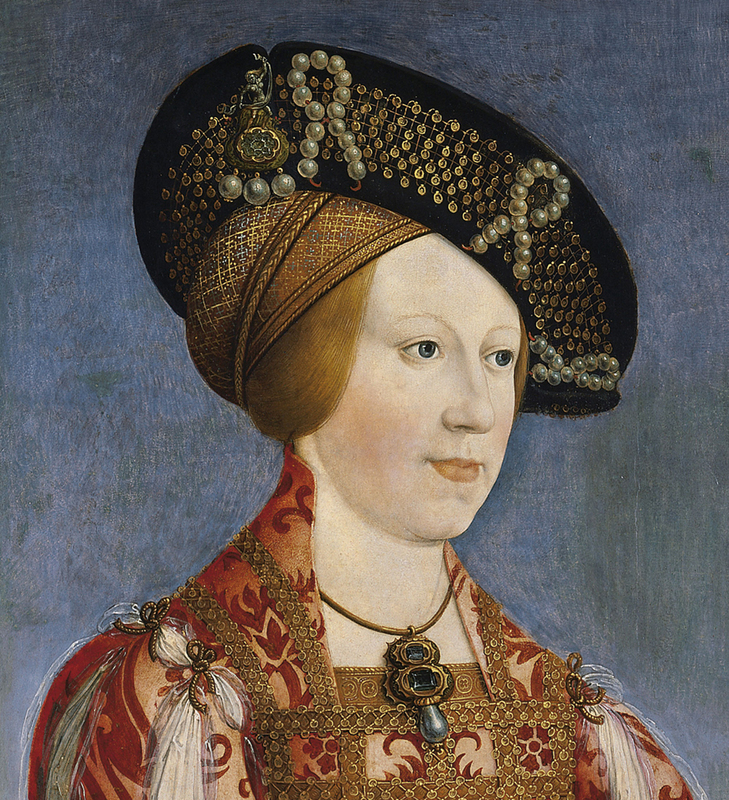 Towards the end of the 1400’s women’s head-dresses became smaller, more convenient, and less picturesque. The gable hood, a stiff and elaborate head-dress, emerged around 1480 and was popular among elder ladies up until the mid 1500’s. They were most common in Burgundy and France, but also elsewhere, especially at the English courts, and in Northern Europe, Hungary and Poland, while uncommon in Italy. They show up in the late 1490s and become popular in the first half of the 1500’s. A soft crowned headwear. By woman it is often worn over other head gear. The fashionable ladies wear them at an angle. A gable hood, English hood or gable headdress is an English woman’s headdress of c. 1500–1550, so-called because its pointed shape resembles the gable of a house. The French hood is characterized by a rounded shape, contrasted with the angular “English” or gable hood. It is worn over a coif, and has a black veil attached to the back. 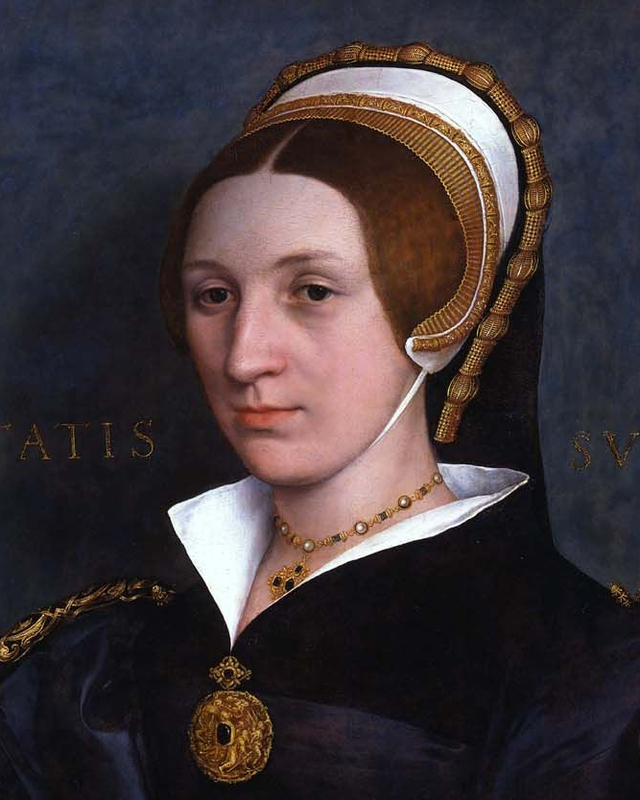 The front part of the hair was always visible.5Wikipedia Popular in the 1500’s.